With more than 140 years experience helping to protect America, ADT protects more than 8 million customers with ADT Monitored Home and Business Security Systems. If you want the finest home alarm monitoring available to protect your home and family, then ADT is your obvious choice. You can also be assured that ADT offers the finest products available in the security industry and has expert installation and service. ADT is the gold standard of home security and is your best option for a professionally installed, monitored security system. ADT offers you a comprehensive network of interconnected Customer Monitoring Centers strategically located throughout the United States. Trained ADT professionals monitor and watch over your home 24 hours a day, 7 days a week, 365 days a year. A single ADT monitored home security alarm system can protect you from burglary, fire, carbon monoxide and help in medical emergencies as well and is connected to one of ADT’s 24-hour Customer Monitoring Centers. Multi tiered disaster preparedness procedures and an Internal Disaster Management Program means ADT is ready for almost any emergency you and your family may experience. If there’s a regional emergency or one ADT Monitoring Center has a problem, another ADT Monitoring Center immediately takes over to give you a continuous connection to ADT’s monitoring or dispatch support. ADT professionals are supported by the interconnected network of ADT Customer Monitoring Centers with powerful computers, secure communication links, state-of-the-art telecommunications equipment and multiple backup systems. No other security company in America comes close to providing you the backup protection you receive with the ADT Monitoring Center Network. ADT has the most comprehensive monitoring network in the security industry and is without question the best company to protect you and your family. See what our clients are saying about ADT alarm system on our ADT Alarm Review page. ADT has some of the finest gaurantess in the security industry. No one watches out for you better than ADT. Homeowner’s Insurance Certificate: May save up to 20% off your homeowner's insurance. Every manufacture in the home security industry would absolutely love to work with ADT. Because ADT protects more clients that the next 100 monitored security companies in the US combined, worldwide manufactures are continually presenting their latest cutting edge technology to ADT. With ADT being the first security company to offer digital monitored security systems, they have been leading the way in home technology for many years. 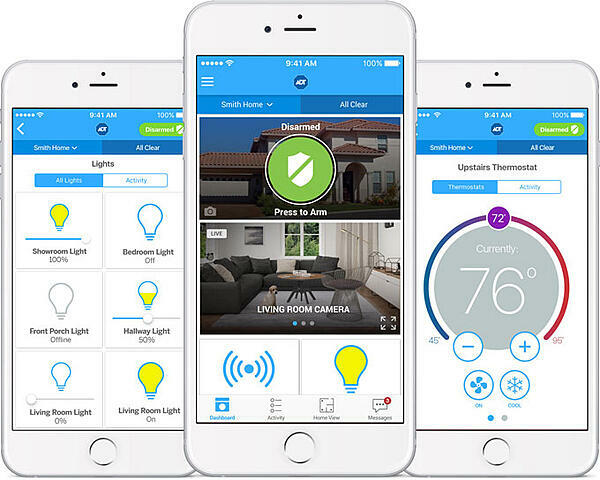 ADT now has millions of homeowners connected to their homes via the ADT Pulse Mobile App and leads the way in providing homeowners with a connected home. In recent years, ADT has challenged the world's largest manufactures of security equipment to introduce their plans for future products. Exciting times are ahead when it comes to the smarthome and home security. Being the most trusted brand in the home security industry, ADT must ensure that new technologies are 100% reliable. ADT creates product specifications they demand from manufactures. ADT Product Testing Lab does rigorous testing on all new equipment...The testing facility is very extensive! Each product is tested independently and each product is also tested by integrating it to a system that is pushed to the max of it's capabilities. The system emergency signals sent to central station are then tested for there ability to work flawlessly with the technology platform of the ADT Central Station Network. Once a new product has completely passed the testing and gotten a stamp of approval from the ADT Lab, ADT then does a small beta test with ADT employees to test the systems in real world environments. ADT approves the new products use on a nationwide level. It may take ADT a bit longer to release products on a national level... but when you get ADT approved security panels or security devices installed in your home, you can be assured you are getting only the best quality and superior reliability of ADT monitored security products. It's security technology you can trust! ADT partners with some the world's premiere security equipment manufactures like Honeywell, Tyco, Interlogix, Sercom, 2GIG, DSC, Kwikset, Schlage, Netgear, Ring, Nest, Alarm.com, Amazon and Google Home. When you go with ADT, you can be assured you are getting the world's premium security products to protect your home and family. ADT offers many award winning products that shape the world we live in. "Just had a great meeting with Grant Fecher from ADT. My partner and I are shopping around for a new security system for our home in Claremont, Ca and was really amazed with ADT's pricing and new features. I had ADT years ago and remember them as being good but I still wanted to "shop around" for the best price so we called 4 different companies. ADT was the only one that showed up on time and wasn't trying to push me into buying extra gadgets or features I didn't want. In fact, I keep trying to add on different features to my ADT package and Grant showed me how I could do the same thing be in a cheaper way. I also really appreciated that Grant didn't cut down his competition, unlike the other companies I spoke with. In the end I decided to go with ADT because they had the best service, price and I got the most features for my budget. So far I've been super happy."